What has Dr. McClain been doing? In short, having a great time! This ride has been a blast from the first day. Great companions, fantastic scenery, wonderful support people. I could go on and on about all the postives. Check out Eric Norris' blog site for some of our current pictures. The ride was hard form day one with over 7250 feet of climbing that day and the next. Every day seems to end with several thousand feet of climbing and tomorrow will be one of the highest, up to 10,500 feet! !, Then I am supposed to give a lecture in Montrose, CO. Today one of my patients rode with us. That was a big boost for all the riders to see a success story. Two of our support staff have lost family members to HLH/LCH to there is a very close attachment to the cause. Fortunately I remain well with only a minor strain of my left thigh muscles from some horrendous climbs two days ago (>15% pitch). Others have not been so lucky. We have had altitude sickness in a 26 yr. old, a separated shoulder, and chronic achilles problems in another. Most of us remain well and all are extremely enthusiastic! More photos from Day 1 - Enjoy!! The Big Fix is rolling!! 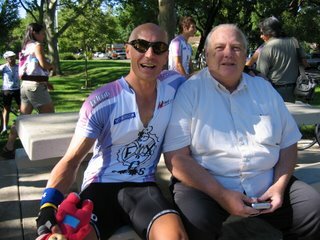 The Big Fix 06 3,300 mile cross-country bike ride rolled out of Davis California this morning following a relaxing start to the day at the Davis Farmers Market. Coffee was kindly donated by Ciocolat, a few words were said at the start and without too much fanfare the bikes were ready to roll. There were a couple of traditions at the start line, each rider was introduced to the audience of supporters, including a sizeable contingent of Davis cyclists. Geoff Toughill from the Histiocytosis Association of America reminded us what this ride is all about then there was the baptism. Each bike has both it’s front wheel and back wheel dunked in a tub of Pacific seawater for the start of the ride. No doubt, the next time these wheels touch saltwater will be in Boston harbor. One by one the riders rolled from the Farmers Market with the Davis locals leading the way. 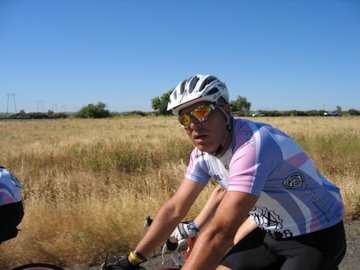 A local rider, Jeff from Woodland rode part of the way in support of his Niece who has Histio. He donated a dollar for every mile he rode today with rider Jill Nepomnick being his designated rider. 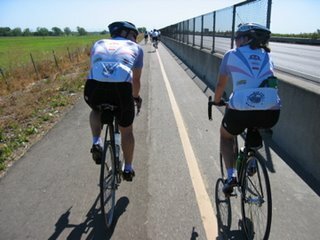 Soon it was over the Yolo Causeway and into Discovery Park in Sacramento for the first rest-stop. A few Cyto’s and cookies later it was a pleasant roll through the beautiful American River Parkway (all bike trail - no roads, no cars) to the second stop at Nimbus Fish hatchery. The weather was perfect and all riders were absolutely loving it. This is where I parted company with the riders and pedaled back to Davis. It is and pleasure and truly an honor to ride with you my Big Fix friends. Live the adventure. 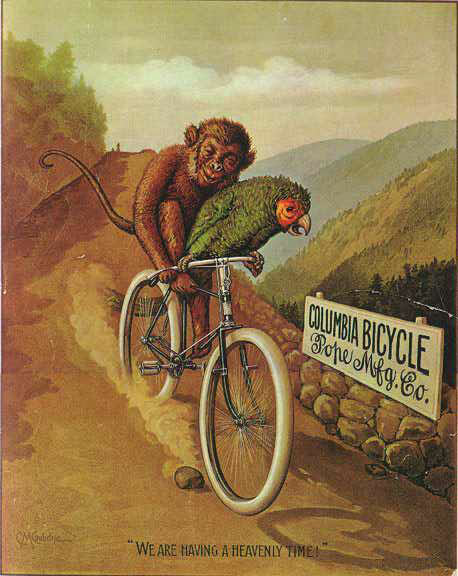 Notice the monkey at left is on a fixie. And pedalling with just one leg ! I knew I forgot to pack something, my bird! After a few days of coping with last minute problems in planning the ride, I am a bit delirious, sorry. But I am sure that riding will be far less taxing--to my brain, anyway, than my anxiety about forgetting something, someone, or not putting in enough planning. I have become superstitious of late, trying to ward off evil, unforseen influences. But if unforseen, how could I know? But I have 95% of the supplies, a great support crew established, thanks to my wife, friends, and Jeff Toughill, President of the Histiocytosis Association. I have been ready to start the ride for about 3 weeks now. I am overjoyed to be meeting riders and histio families--like a new family, but famliar from so much contact over the last 15 months. 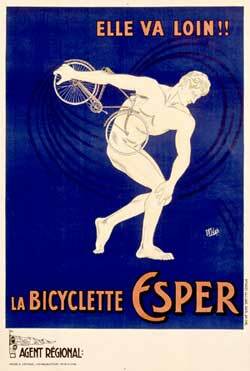 In 6 weeks or less, some of us may feel like hurling our bikes, or just hurling. With the ride just 15 days away, my excitement is barely contained. I know of several others who share the anticipatory buzz. We passed the quarter-million dollar mark for fundraising today, and our new goal is $300K. We of course hope to raise some funds during the ride. I personally hope to explain histio and fixed-gear cycling to some reclusive billionaire (a la Howard hughes in Melvin and Howard film) and score BIG. 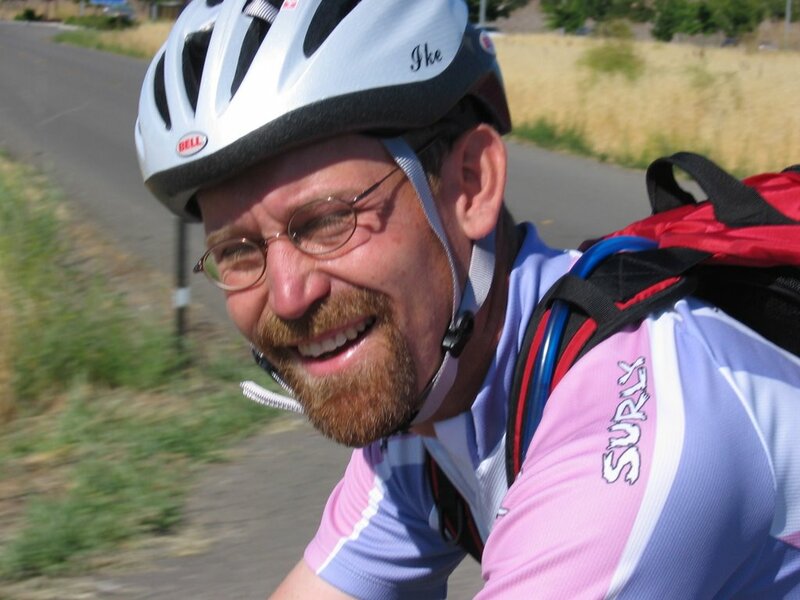 The Big Fix is a 28-day cross-country bicycle ride, using single-speed, fixed-gear bicycles from Davis, California to Boston, MA. June-July 06. We are raising money to fund Langerhan’s Cell Histiocytosis (histio) research.